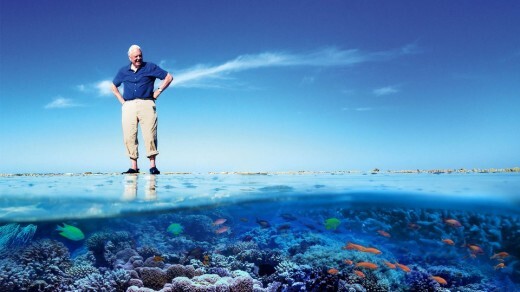 Even Sir David Attenborough acknowledges the Great Barrier Reef is in desperate danger. Many petitions have been signed online (see two here for 141k and 16k). An open letter from 200 tourism operators was published by Mackay’s Daily Mercury outlining the concerns of tourism operators, with the letter making headlines on Australia’s Radio National. A QLD Liberal National Party member George Christensen last year took out a full page ad in the Mercury labelling the actions of tourism operators concerned for the reef ‘Green Sabotage’. Now however, both Liberal and Labor need Queensland in a big way to win the 2016 Federal election. Former celebrity candidate Clive Palmer – who picked up national senate seats with his promises of straight-talking jobs, especially for his pet industry of mining – lost his Sunshine State glow after his tourism and mining operations collapsed dramatically, taking QLD jobs with them. Australians have been left in no doubt about who was to blame for those job losses, and Palmer’s hollow promises have left the senate seats his party claimed up for grabs. The 2016 election has come down to reef operators vs mining operators. Labor want to promise jobs in QLD – Liberal want to promise cash in Queensland. These jobs were formerly found in mining, but during an acknowledged downturn, it’s tourism’s time to shine. 2016 may be the best time ever for tourism operators to stand up for the reef. 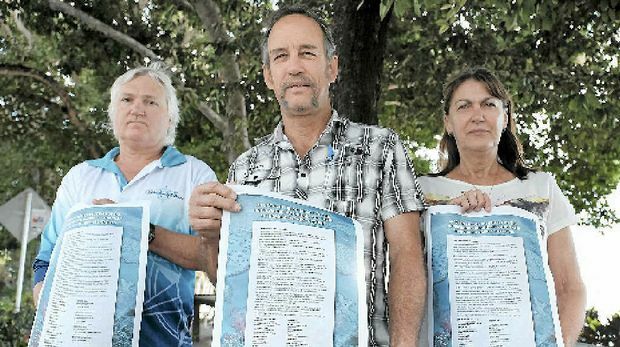 CONCERNED local business owners who signed a full page ad in Friday’s Daily Mercury (August 21) calling for an “honest and mature” conversation on the future of the region’s economy have been described as “not representative” of the greater Whitsunday tourism and business community by Federal Member for Dawson George Christensen. The ad, an open letter on behalf of a group of 25 Whitsunday business owners and managers, was written in response to another full page ad placed in the Daily Mercury on August 14 by George Christensen’s office, titled “Green Sabotage”. “The extreme greens have tried to kill off the Carmichael mine and Abbot Point expansion. What will be lost if they succeed? Thousands of jobs,” read Mr Christensen’s advertisement. Friday’s advertisement, authorised by Whitsunday local Tony Fontes and signed by local business owners, detailed their concerns with Mr Christensen’s “inaccurate advertising”. “According to your advert, conservation groups have sought to kill off ‘thousands’ of jobs. These jobs don’t exist. They may never exist. But if we push ahead with dredging and port development, we risk existing jobs,” the ad read. But Mr Christensen said the advert was the work of the Mackay Conservation Group. “This is not the result of local businesses feeling aggrieved, it’s the result of yet again another organised green campaign,” he said. On the matter of job creation, he said the1464 jobs Adani spoke of in court referred to stage one of the Carmichael mine, with their previously quoted figure of 10,000 jobs referring to all direct and indirect jobs created during the lifetime of the mine. Mr Christensen also said he believed the Association of Marine Park Tourism Operators, Whitsunday Charter Boat Industry Association and Whitsundays Marketing and Development Ltd, had no problem with the expansion of Abbot Point as long as the dredge spoil was placed on land. However, one of the letter’s signatories, local electrician Eric Oliver, said Mr Christensen was attempting to vilify people who cared for the environment by saying they were destroying jobs. Mr Oliver said since the LNP had come to power, the number of unemployed across the country had risen by 100,000. “In my industry, many Australian-owned businesses have been closed down and more than 2000 jobs have been lost in the renewable energy sector alone, directly related to the LNP’s retrograde policies and cuts to the Renewable Energy Target,” he said. Dozens of Queensland small businesses, many which wouldn’t exist without the Great Barrier Reef, have issued a dire warning to Prime Minister Malcolm Turnbull. The open letter published on Saturday comes as new research predicts bleaching as severe bleaching could become the “new normal”, recurring biyearly by the mid-2030s. In a move contrary to recent attempts from tourism bodies to downplay the extent of the bleaching, 175 tourism operators, dive professionals and tradies labelled the mass damage a “disaster needing urgent action”. They called on the Turnbull government to rule out any financing, investment or help with associated infrastructure for the Abbot Point coal terminal expansion and Adani’s controversial Carmichael mine, the largest in Australia. They pointed the finger at climate change, calling for investment in renewable energy projects, particularly in regional Queensland and a band on any new coal mines. Eye to Eye Marine Encounters director John Rumney said some businesses had been afraid to speak out, worried it could mean bad publicity. “But the long-term viability of all our businesses relies entirely on Reef staying healthy and it is in danger,” he said, in a press release issued by the Climate Media Centre. “The worst of the bleaching might now be over, but climate change isn’t going to go away. 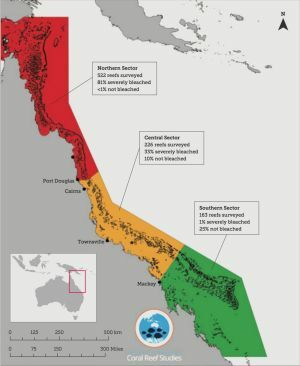 The National Coral Bleaching Taskforce’s latest report found about 93 per cent of the reef was impacted by the event, with the most pristine stretch in the north worst affected. Within the 1000km stretch north of Port Douglas, researchers estimated at least half of the coral would die. The bleaching lessened the further south they travelled but only 68 of 911 individual reefs surveyed escaped bleaching entirely. The letter from the “stewards of the Great Barrier Reef”, published in part in the Mackay Daily Mercury on Saturday, starts with numbers: Two million visitors annually. Almost $6 billion to the economy and 69,000 jobs. “Global warming, driven by the mining and burning of fossil fuels like coal, is heating up our oceans and bleaching the reef,” the letter reads. The businesses’ call came as the Climate Council released its final report into the bleaching event, blaming rising ocean temperatures driven by climate change for the damage. Extreme coral bleaching will become the “new normal” unless serious reductions in greenhouse gas emissions were achieved, the report warns. “Climate change is very likely to make the extreme ocean temperatures that caused this year’s event occur every two years during March by 2034,” it reads. 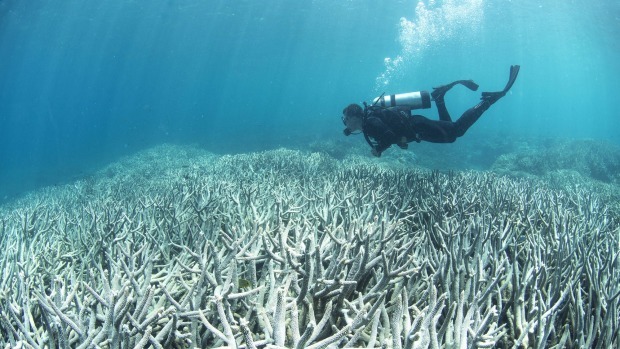 Author Professor Will Steffen warned of “smoke and mirrors” around the reef’s ability to recover, saying reefs would struggle to survive as bleaching events became more severe and closer together. “Depending on how quickly the record-breaking ocean temperatures wane, the reef may be able to partly heal in some areas in the short-term,” he said. “But in the long-term, the reef’s capacity to recover will depend on how much and how fast we reduce our greenhouse gas emissions in the next few years.